As many of you are aware, we have been targeting an April release for the next major update to Friday the 13th: The Game since our announcement that the game would be moving to an updated version of the Unreal game engine. We have known that hitting a date in April was ambitious, and a best case scenario, but we believe that people should strive for their best. Today we have been forced to accept that the update will not be able to be released in April. The update is shaping up nicely, but there are still a few issues that we need to iron out to ensure the best gameplay experience for our players, and we still need to pass the patch through console certification. Our goal is to make sure the work is done right, and that meant we needed some extra time with it. Why didn’t you release on Friday the 13th of April? This update has been a massive endeavor. The game engine upgrade alone means that the team at IllFonic has had to go over every system in the game and check, tweak, or recreate it. They have been doing amazing work at an intense pace throughout the update process. We are incredibly proud of their progress and everyone at Illfonic and Gun are anxious to get the update out and into the hands of our players. However, setting a hard release date, with the amount of features and upgrades included, would have only served to undermine IllFonic’s work for the sake of hitting a specific day. The game, and our players, would have suffered from it. We are in the later stages of finalizing, but we are not yet at a place in the process where we can state a specific date with certainty. All of our major reworks and new features - updated game engine, Single Player Challenges, Victoria, Bot AI Improvements, Weapon Switching, Legendary Perks, etc. - are in place in our development builds. However, we are at least weeks away from release, and if major issues are found we will work to solve them before release. What we do know is that there is no longer a possibility of hitting a release date in April, and we felt that we should let Friday the 13th: The Game players know. This is, by far, the largest technical update to release for Friday the 13th: The Game. In addition to the implementation of our new and reworked major features, everything in the game needed to be checked over due to the engine revision change. That said, we realize that our players are used to an update every month or two, and we understand the disappointment of the update not being released in April. Every piece of “Thursday News” that we have released since February 9th, 2018 is finalized in the update. The engine upgrade is complete (there’s a comparison video lower in this post), Single Player Challenges are finished, as are Weapon Swapping, Keybinding, the altered Jason Grab, Legendary Perks, AI Improvements, the Salt Mines, Part 7 Jason rework, and Victoria Sterling. All of these features are in our development builds and are working well. Right now, we’re buttoning up the build. Are you going to “surprise drop” this update? No, the next update is a massive milestone for us and we will not be silent about its release date. We will be releasing communications about the update’s release before it comes out, and we will communicate the date as soon as it is certain. You posted while I was reading. Lol. I shouldn’t have waited. Means we gonna get this may and i am excited??? you get it out when you get it out. I'd rather have a finished product without glitches than a broken product rushed out. Keep up the good work. The 1 year anniversary of this games launch is coming up. Perfect time to drop an update of this magnitude. I always thought from day one that this update will never be there before mid-May / early-June ... so still fine by me. Just do your best and release it when it's ok. And thanks for making this game greater and greater. I expected as much to be honest, but the game really does need it soon. I don't understand the engine change if it was for darker shadows and shinier rain looking textures. I'd of preferred to have bug fixes and content over this without waiting so long, but it's whatever. All I will say is that the update better fix and add alot to the game or I think you'll find many will be over it. I wasn’t expecting April, so no big deal to me. Appreciate the transparency and not waiting until 5:00PM on April 30th for the news. THIS is what I love about you guys. Thanks for the update. In the meantime DbD still looks like an old PS3 game with no real change in his gameplay. Looking good! Initially I didn't see much of a difference other than the fact everything is darker, but on a second look I noticed the leaves and enviromental details are much more polished and detailed. And of course, the promised solution of many bugs and glitches on it's own is a big thing. 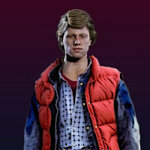 It also looks like they've not polished the models of the counselors as we were speculating though. Sad news, folks, looks like Jenny will continue to have the mop on her head. There's an echo from a year ago in this forum chamber ?? This is going to be on forum member's headstones. Wes will probably lay a glitch ridden wreath on our graves. Speculation started damn fast lol While it does sound possible that it could hit in May, that was not specifically stated. Fingers crossed but let's please not have a dozen "update coming in May" threads started.